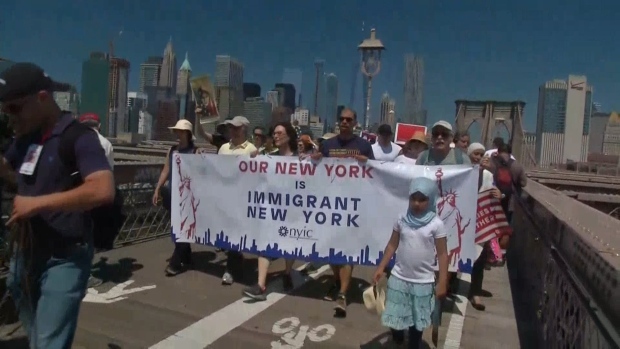 Protesters chant slogans and wield signs calling for the abolishment of Immigration and Customs Enforcement, or ICE, June 29, 2018, in New York. A federal judge on Monday determined the U.S. government is violating its own rules regarding the treatment of people seeking asylum. Judge James Boasberg issued a preliminary injunction ordering the Immigration and Customs Enforcement agency to stop what opponents called the arbitrary detention of legitimate asylum seekers. The case in question continues, but the injunction opens up yet another legal front in the multi-directional battle being waged by the Trump administration over immigration. 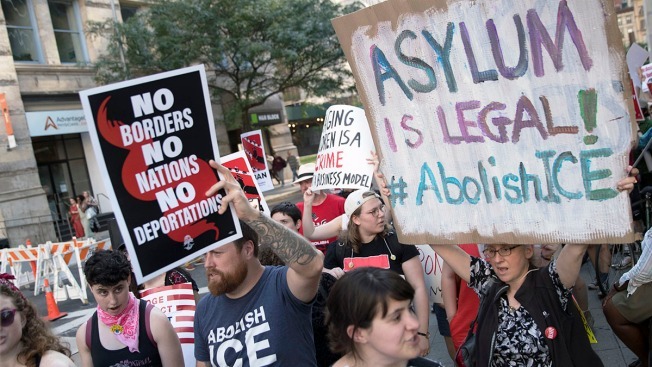 "This ruling means the Trump administration cannot use indefinite detention as a weapon to punish and deter asylum seekers," said Michael Tan, senior staff attorney with the American Civil Liberties Union's Immigrants' Rights Project. All immigrants seeking asylum must initially pass a "credible fear" screening to determine if they face a threat of persecution in their home countries. Those who fail that standard are deported immediately. Previously, those who passed were usually given humanitarian parole while awaiting an immigration hearing, provided they were not considered flight risks or dangers to the public. Under former President Barack Obama's administration, ICE granted humanitarian parole to more than 90 percent of asylum seekers. Lawyers for the ACLU and other groups argued in May that since the start of President Donald Trump's administration, the number of people granted such parole has dropped to almost zero in five key ICE field offices: Detroit; El Paso, Texas; Los Angeles; Newark, New Jersey; and Philadelphia. Those denied parole have instead been detained; in one case, a former ethics teacher from Haiti has spent more than 18 months in prison. Judge Boasberg, in a 38-page memorandum opinion, concluded that "the numbers here are irrefutable," and ordered a case-by-case review of all asylum seekers awaiting parole. Meanwhile, the lawsuit will continue with a status hearing July 10. "The denial letters that they were issuing were just boiler-plate — deny deny deny," said Hardy Vieux, legal director for Human Rights First. "This is the court saying, 'I've seen enough to tell (the government) to stop what you're doing and we'll talk later.'"